This month we rolled out two powerful new features: Team member permissions and Invoice Rules. Both of these were the top requested features from our customers and we are excited for you to begin using them today! 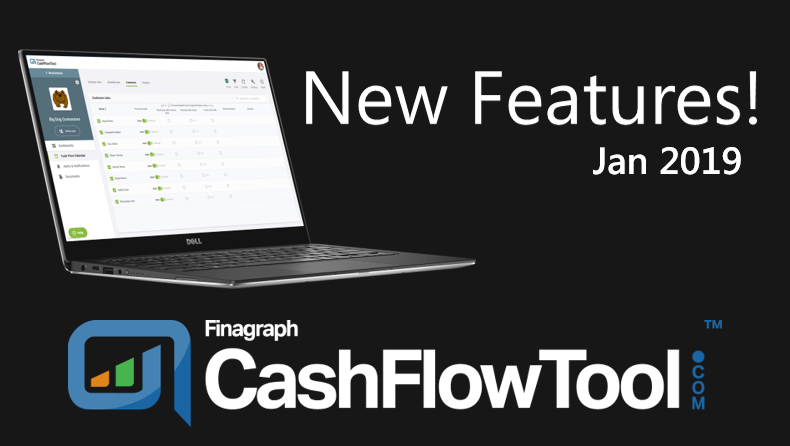 We are excited to announce several new features that will give you even more flexibility and capability using CashFlowTool. Team member permissions for dashboards, calendars and more. CashFlowTool makes it easy for you to keep all your team members up-to-date while staying in control who has access to key data. Inviting team members has been enhanced and now allows you to set permissions when inviting a new team member and control which areas of CashFlowTool the team member has access too. For example, you can create a CFO dashboard which only the CEO and accountant has access to, and a sales dashboard which only the sales team members have access too. To invite a team member and set permissions, view the Business’s settings, and select Team Members. When inviting a new team member, enter the user’s name, email address and check which areas of CashFlowTool the user has access to. To save time, you can choose to copy access permissions from an existing user. At any time, you can revoke a user’s access and modify their permissions. 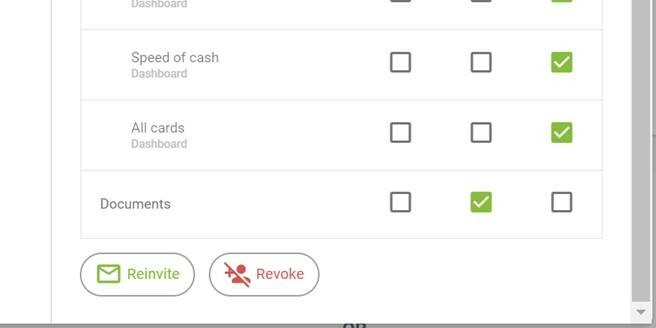 From the Team Members settings dialog, choose the team member to view current permission and revoke access. If you have existing invited users, you will need to review and update their permissions. By default, invited users will have no access. 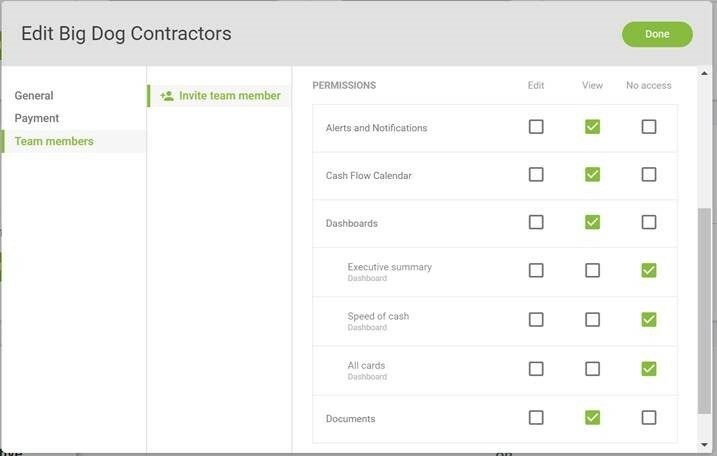 Select the business and view settings to see your team members and update permissions. If you find you no longer have access, contact the account owner and ask them to grant you permissions. · Only the account owner can invite new users and set permissions. The account owner is the person who added the business to CashFlowTool. · When a new dashboard is created, users have no access by default. You can grant access to new dashboards by editing the business’s Team Members under the business settings. CashFlowTool uses CashLearn to automatically predict when future invoices will be paid and their amount based on analyzing past transactions. Depending on the nature of your business there maybe times where you want to override CashFlowTool's forecasted payment date for an invoice and use a predetermined method (i.e., fixed number of days to pay, invoice due date). You want to always exclude a customer or vendor from the cash flow calendar. You have setup a recurring payment with a customer or vendor and know the exact day the invoice will be paid each time. A customer does not always pay in accordance to the contractual agreements (i.e., due dates), but you would like your cash flow forecast to be consistent with the terms. You want to view your cash flow forecast assuming the invoice is paid a fixed number of days after the invoice date or on the invoice due date. The actual payment date is erratic and you want to view you cash flow calendar assuming the customer pays on-time. You have negotiated new payment terms with a customer or vendor and want the future forecast to reflect that change. Unpaid Invoice Payment Date Rules allows you to specify how unpaid invoices payment dates should be forecasted. You should use these settings when you want to always exclude a customer or vendor from your cash flow forecast or you have specific knowledge about a customer or vendor and want to override the CashLearn’s predictions. From the Cash Flow Calendar view, two new tabs are available, Customers and Vendors. See lists of known customers or vendors based on looking at the last 12 months of transactions. Indicates if the customer or vendor should be included in the forecast. When checked, the customer or vendor will be included in the cash flow forecast. Uncheck customers or vendors that you want to exclude from the forecast. Uses the fixed days after the invoice date. If selected, you can specify the number of days. Uses the average number of days to pay based on invoiced date. The customer and vendor list are generated from the last 12 months of transactions vs. reading the customer and vendor list from QuickBooks. This ensures that all customers or vendors are listed even if the customer or vendor is no longer listed in QuickBooks. After you save your changes, the rules are automatically applied to the cash flow calendar and used every time you update your finances. CashFlowTool now gives you control how unpaid invoice payment dates are predicted on the cash flow calendar on a per customer and vendor basis and provides you an even more accurate view of your cash flow calendar.